Butser Rubber have extensive manufacturing facilities to produce custom rubber gaiters using a range of rubber and silicone materials. We have experience supplying large-scale companies (OEMs and tier 1) with mass production components as well as ‘one off’ products for prototyping and Motorsports (Including Formula 1). 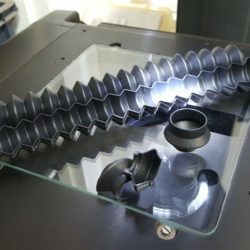 We can meet your project requirements with excellent quality and competitive pricing by using a wide range of rubber bellow manufacturing processes including custom injection moulding, compression rubber moulding and transfer injection moulding. Butser Rubber customers benefit from our extensive custom rubber gaiter moulding equipment. Through heavy investment in automated machinery, we manufacturer bespoke rubber gaiters using a range of moulding techniques including injection moulding, compression moulding and transfer moulding. Our rubber moulding service can also include certification including PPAP Level 3 documentation and Certificate of Conformity. Butser Rubber have a range of over 350 ‘off the shelf’ rubber and silicone materials. Our most popular materials include HNBR, Natural Rubber, EPDM, Nitrile, NBR and FKM. We also stock specialist materials with particular properties such as high temperature resistance, oil and fuel resistance and chemical resistance. 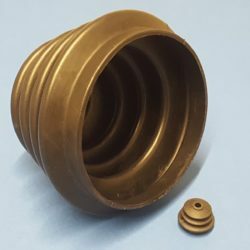 Butser Rubber also specialise in ‘loaded rubbers and silicones’ which contain a rubber/silicone compound mixed with other materials offering properties such as increased electrical conductivity and increased material modulus. Custom moulded rubber gaiters are primarily used as a protective sleeve for sealing moving components from dust and liquid. The gaiter typically surrounds a shafts, rod-ends and ball joints and offer extensive resistance against contamination. 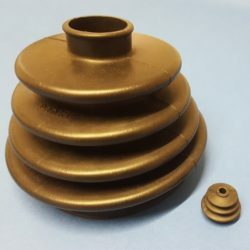 Butser Rubber provide customers with over 40 years of rubber gaiter manufacturing experience. We will offer guidance throughout to ensure the final product meets your project specification in a short lead time. The deep of the gaiters convolute. Removing as many ‘sharp edges’ from the design as possible to avoid tearing the bellow during moulding. Remove gaiter undercuts to avoid expensive tool designs.